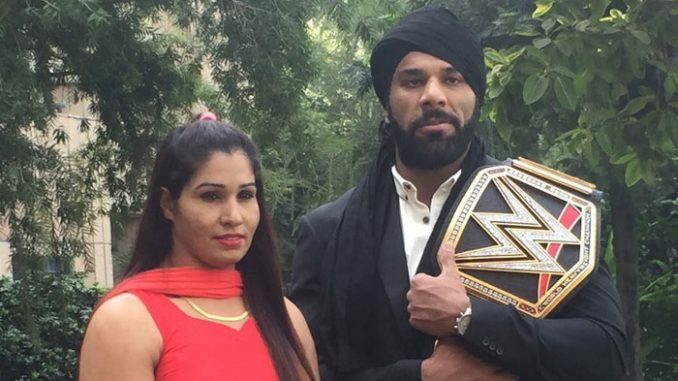 NEW DELHI: The women’s division of the WWE has lately become one of the company’s topmost priorities and keeping up with that trend, the company has recruited its first Indian signing in its rich history. Kavita Devi, who was part of the WWE’s Mae Young classic tournament, has made history by becoming the first ever woman wrestler from India to be awarded a WWE developmental contract. The announcement was made by none other than the WWE Champion Jinder Mahal during his visit to the nation’s capital. Devi is an accomplished power-lifter who won gold at the 2016 South Asian Games, representing India. Devi also has the distinction of being the first Indian woman to compete in a WWE ring, during her participation in the Mae Young Classic. A former Kabaddi player in high school, Devi learned her ring skills from her mentor, former WWE World Heavyweight Champion The Great Khali (Dalip Singh Rana). She is expected to begin training at the WWE Performance Center in Orlando, Florida this January. The Modern Day Maharaja, Mahal, had nothing but wishes and good word for Devi. “I’m extremely proud to welcome Kavita to WWE where she now has a great opportunity to become India’s first female WWE Superstar. She is an inspiration to the youth of India and I wish nothing but success for her,” said Mahal. In another first for WWE’s women’s evolution, WWE also announced in Dubai that Shadia Bseiso from Jordan becomes the first Arab woman from the Middle East to sign a WWE developmental contract. The WWE Performance Center is the home of the developmental system for WWE. With seven training rings, a world-class strength and conditioning program and cutting-edge edit and production facilities, the Performance Center allows new recruits to hone their skills through a comprehensive program that includes in-ring training, physical preparedness and character development. Additionally, recruits will be immersed in WWE’s Professional Development program that focuses on four key pillars: Life Skills, Education, Wellness and Career Success.